6. highlight and update your favorite stitch patterns. Who here has a Stitchionary (or two or ten)? I do, a lot of them in fact. 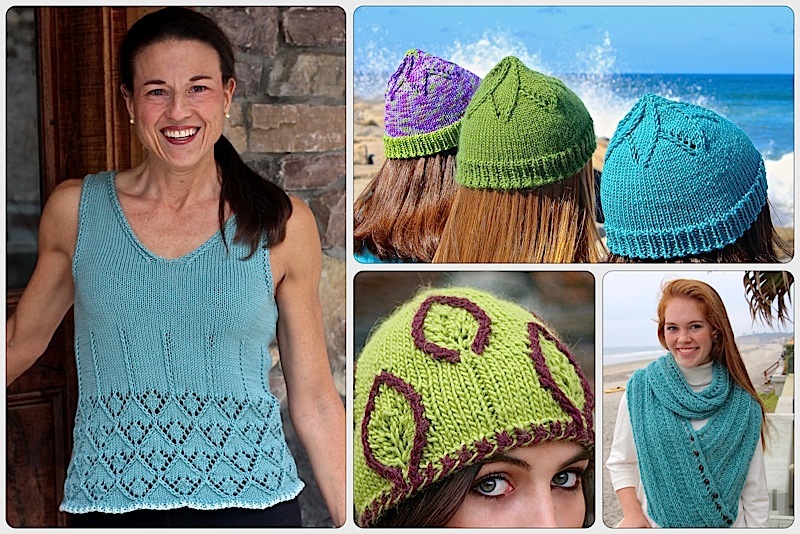 What do you think happens when you add the Showy Decrease to standard stitch patterns? Ka pow! In the last post about matching double decreases, I promised you there were curves ahead. Now you can see why. the use of garter edges (not my favorite). Here’s the original swatch. I’d like you to take a look at the decreases along the garter edge. They’re not really a factor in the look of the pattern, are they? And, of course, the left leaning sssk decreases are not as good looking as the k3tog. The 4 pins are placed on the corners of the cast on and bind off edges. See how the garter edges pull the swatch out of shape? There were a number of things I wanted to fix in the next swatch. The first of which was to use the edge from our most popular post of all time (over 29,000 views). It’s the Hatch Edge which eliminates the condensing impact of a garter edge and still prevents rolling. The use of the new edge allows the stitch pattern to stretch out. I did not stretch the swatches at all when pinning them. The decreases are now a decorative element as well. The hole wasn’t fixed to my satisfaction so I tried something else and fixed it in the actual scarf pattern. The next posts will show you the dramatic scarf pattern shown above and the new one that resulted (sample shown to the right) from all the swatching I was doing to test the best method to k3tog and sssk. In the mean time, if you’d like to check out some of the other ways we’ve used the Showy Decrease here are some links for you. Deep ribs of Telluride Scarf and Snowed In Headband. Our first free ebook, a 20-page tutorial on Showy Garter Stitch. We also have a blog category dedicated to the Showy Decrease that includes details that will help you use this technique in your other knitting projects. This entry was posted on March 3, 2017 by Laura Cunitz in Nuances, Showy Decrease and tagged knitting, Showy Decrease.